All sorts of games and play – live, board, RP, and video – and the theory behind them. Writing about story, storytelling and narrative, in theory and practice. People and the way they socialise and operate in groups, particularly on social media or in online communities. Writing about politics and current affairs. Prose, creative writing, poetry and other bits and pieces. Mary Hamilton on Hello again. Andrew Losowsky on Hello again. What if papers used games as a news medium? There are a few news outlets already making moves in this direction, but I haven’t seen much in the way of commentary or ideas about taking it beyond quiz apps and into educational tools, social activities or, well, making it fun. Here’s the thing. I reckon news – especially news online where attention is easily lost – should be entertaining. It should be interesting, engaging, thoughtprovoking and, if possible and where appropriate, fun. Could games be a news medium? Could we use online games to tell or break stories, or to foster real engagement with and within our communities? Here are nine ideas. Let me know what you think in the comments. Hat tip: I’m indebted to Margaret Robertson for a talk at Greenbelt 09 that pointed me towards some of these games and got me thinking about narrative crossovers between real life experience, current affairs/news and gaming. This is the easy one. 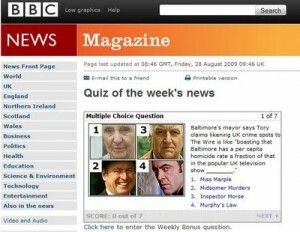 Quite a few news outlets have online quizzes, little more than simple forms that grade users on how well they’ve retained the news. NBC has gone a step further with a Facebook application called What’s Your iCue. Based on the corporation’s learning site, it quizzes users about their videos and encourages them to compare scores. In theory, it’s simple and engaging, it spreads their brand and it drives users not only to engage on Facebook but also to watch their news. Still in the realm of what’s already been done, I present Newsblaster, MSNBC’s addictive little news. It uses a familar and easy game format – bubble blaster – and for each group of bubbles you burst, it rewards you with a headline and a gateway to a news story. Links to stories stack up in the sidebar, and you can interrupt the game at any time to check them out. It’s a good game in its own right – it’s a casual timewaster that draws traffic to news stories by presenting a random array and letting users select what they want. Swinefighter is never going to win any prizes for game design – or for tact. You play a doctor with a hypodermic needle, scrambling to inject flying pigs as they hover above a map of the world. It’s pretty silly. Where things get interesting is the rest of the page. The game is embedded on a site that includes donation links to the Red Cross, as well as a simple list of ways to help prevent the spread of swine flu (taken from the US Centre for Disease Control). The game spreads virally (forgive the pun) and the information goes along with it. Stop Disasters is a game developed by the UN to bring attention to how to, well, stop disasters. You can play through several scenarios (hurricane, wildfire, tsunami): you’re given a town or village, a budget and a time limit, and your job is to develop the area so that as many people as possible survive. It’s full of information – helpful facts, advice, statistics – and it’s fun to play. Without you really noticing, it teaches you the background and the context that’s so often missing from news stories, and it humanises disaster victims by making players care about what happens to them. Similar in style though not content, the McDonald’s game invites players to manage the empire. It’s biased to make a point – it’s impossible to run a corporation like McD’s without making some dubious moral choices. The player must oversee the whole operation and decide what choices to make. It teaches you about the whole process of running the chain, from the field in Brazil to the slaughterhouse to the boardroom to the restaurant. It forces you to take a much more holistic view than the normal consumer – and introduces you to some unexpected truths. Imagine a game like this one based on managing the NHS. Or the US healthcare industry. Or the international banking system. The Hidden Park is a kid’s game for the iPhone. You download it and then head out to your local park, where the game uses the phon’s built-in GPS to lead you around, asking you to take photos of various things in order to find magical – imaginary – creatures which appear on the iPhone screen rather than in real life. There are a host of other applications using this technology, ranging from apps to tell you the fastest route to the nearest Tube station to apps that project social media information next to the image of a real person standing next to you. Using this, papers could offer even more exciting interactive maps – immersive applications showing you all the data of Everyblock projected onto the world around you, for instance. Events listings, classifieds, food reviews; crime stories, council stories, controversies. If money, time and skills were no object, how about an app that projected what planned controversial developments like the Rackheath eco-town and Norfolk Hub could look like, with links to background info? Alternate reality games (ARGs) use multiple platforms and encourage people to work together to solve puzzles, operating online via social networks and in meatspace, using multiple media. The Rochester Democrat and Chronicle has teamed up with some local technology graduates to create Picture the Impossible, its own interactive ARG. Participants – there are more than 1,000 registered, and 830 on Facebook alone – are split into three teams, which will compete over the next six weeks playing online and offline creative games based around the city and the newspaper, to earn money for three charities. The internet is creating new communities everywhere, niche networks with very specific concerns, some of which revolve around gaming and virtual reality. Newspapers reporting on the concerns of these communities – or even reporting on meatspace issues via these platforms – can be successful. Second Life is an immensely popular and immersive virtual world/massively multiplayer online role-playing game (MMORPG). The community boasts three newspapers – the Metaverse Messenger, Alphaville Herald, and the Second Life Newspaper – which blur the lines between real-world and virtual events, reporting on both equally. They cover social and technological issues around the game environment as well as goings-on within the virtual world. 300,000 people regularly read the Metaverse Messenger, and in May the Alphaville Herald celebrated its 50,000th reader comment. CNN has a large community-based presence there; Reuters moved out in February. Is this – or are other MMORPGs and virtual environments such as Gaia – a potential market for mainstream media? If you don’t already know about Superstruct, take a look. It’s an amazingly innovative interactive game that ran for six weeks last Autumn. Thousands of people worldwide got together to tackle six problems that could bring the world to its knees in ten years time, working together to devise ways of avoiding the self-destruction of humanity. The content they produced is full of original ideas, re-imagining social, economic and technological systems for new purposes. The game is a lasting testament to what’s possible when people with imagination have conversations, and it’s proof that user generated content can mean far more than an inflammatory comment. What if papers offered this sort of platform?